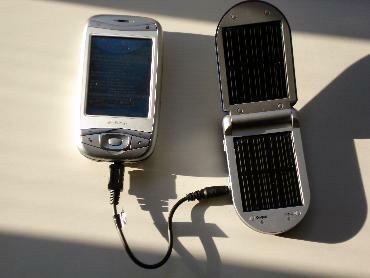 Back in February I reviewed the SolarStyle SC003 solar charger for pocketnow.com. One of my complaints was the lack of connectors for PDA's, and the iPod. I recently went to their website and they are now providing a much better selection of connectors, including the iPod. I ordered the connector for the Motorola Razor which works with my T-Mobile MDA. They also have a newer solar charger, the SC017 which looks like a Razor, the only major difference with the SC003 seems to be the solar cells; they provide 80mA of current vs 72mA. This a great tool, I can now depend on for those power emergencies. I also reviewed a more traditional emergency power pack from Gomadic which uses 4 AA batteries. This is Shenzhen (China) Aiwade Electronic Technology Co.,LTD, It is a specialized in R&D, production, sales of solar cells,solar panels and solar products.The Solar products including solar mobile chargers,solar laptop charger,solar charger bags,solar charger waistcoat,solar lights,solar pumps,solar generator system,solar gifts,solar home appliances,solar radios,solar torches and so on. Please view our website:http://www.aiwade.com if you feel free. In addition, I viewed the solar products you are selling from your website, I think that maybe you are interested in our solar products and then purchasing some for your wholesale or retail in your home market. Please contact me at anytime if you have any inquiries. We will very appreciate you if you give us a cooperative opportunity! Thanks in advance! Shenzhen (China) Aiwade Electronic Technology Co.,LTD. This is shelly from china ,solar charger for mobile&laptop manufactuer, We have one new patented protection solar charger with CE RoHS FCC for Iphone/blckberry/samsung galaxy/smartphone.if you are interested in ,contact me .the catalogue will be sended to you .